You cannot change the "cutting order". MTC is designed to cut the inside cuts first and then the outside cuts. This is so that you would encounter less shifting or moving if you cut the outside larger shapes first. Besides that, I am not sure how it decides exactly what to cut first. I think it has something to do with how they are first put on the mat/laid out. One way you can "control" a little bit is if you put shapes/objects on different layers and turn layers off and on to cut or not cut. If the layer you are cutting still has "inside" cuts and outside cuts, its still going to do the inside cuts first. Forgetting the fold lines, are you saying the outside cut shape of the box isn't continuous? In other words, it's not a closed shape? @SandyMcC it seemed to be cutting one part of one side and then going over to the other side and doing a different part rather than just going all round the outside. I will probably have another go later. If you draw the shapes yourself within MTC does it make a difference how you do this to what order things are cut in? To fix your outside path, first hide any layers that are the fold lines. Then, click on one part of the outside path and see if all parts of it are selected. That means it's joined. If only one part gets selected the drag your mouse to select all of it and apply Join. Then click on the wrench icon at the bottom and select Fuse n Weld. Click on Optimal. That should close it up and make it one continuous path. If you can't get it to work, then send me the file ([email protected]) and I can make a video showing how to do it. @Pippin, you have found the hidden secret - MTC uses machine logic rather than people logic. We look at it and say, well it should cut all the way around the box, that's obvious. But MTC looks at it and says, what is the best path to get this done quickly and accurately? Then it cuts in a way that makes us batty. As has been noted, we can manually make MTC cut what we want by splitting the shapes into layers. Then turn off all layers, except the box outline and it will cut only the outline. 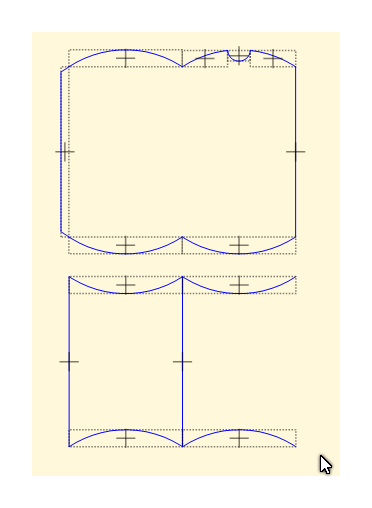 Not saying it will cut a continuous line all around the outline shape, it may well cut down one side, then down a different side, without connecting the two cuts. Then across both sides to finish the shape. Then you would close the eye on that layer and move to the next where you may also still get "batty cutting paths". What I'm trying to say is that after fighting with MTC machine logic, I came to the conclusion that it was just easier and faster to let MTC cut my projects in any sequence it wants. It's weird to watch the Zing zip around my designs cutting a side on a box and then zip down to another box somewhere else in the design and cut out a line or two there. In the end, it cuts them all and much faster than if I were messing with turning on and off a bunch of layers. Just my 2 cents. Yes it can drive you batty watching a cutter dance all up and down a mat cutting in a logic that only makes sence to MTC. To preview a cut order, select all, CTRL+SHIFT+X and view the cut order by clicking first node, then press and hod the down arrow key. So for example duplicate it will cut the far right shape in first row first, then go to far right in next row, then far right in next row, etc. coming back up to the first row for second shape on the second row, and carry on in that pattern. I do suggest you test for yourself using my suggestion above. Andy has been programming since he was like 7 years old, and I can confirm if you ask 5 people how to file something, there will be 5 different answers. There is no right or wrong answer, as long as it works for the person or persons having to retrieve the items filed - system efficiency is a totally different thing. As someone who hired programmers to write complex database systems, I often disagreed with how those programmers applied their logic. I would boil it down to they have never done the job the user does, so they don't really have a clue as to how it should be approached, LOL!! !